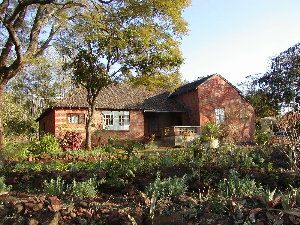 My friend, Hanri Vogelzang, invited me to join him in visiting his friends, Frik and Berinda Kruger, in Malawi. Frik is a doctor at Nkhoma Mission Station, some 35 km east of Lilongwe. Photo H.D. Oschadleus Frik and Berinda's house and garden. The house is on a hillside. Photo H.D. Oschadleus Late afternoon view south-eastwards from the house. Photo H.D. Oschadleus Early morning view eastwards from the house. Photo H.D. 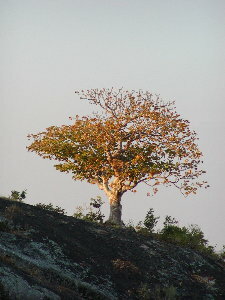 Oschadleus Tree basking in the late afternoon sunshine. 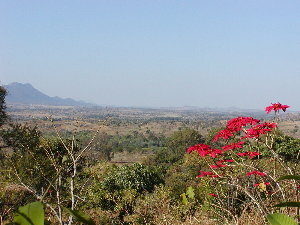 Malawi was wonderfully warm in mid-winter, although some days were cooler. It was pouring with rain in Cape Town when I left. Photo H.D. Oschadleus Male Yellowbellied Sunbird. These were common in the garden. 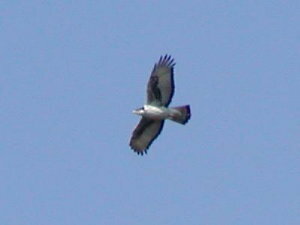 This species occurs from Zimbabwe northwards, so is not a bird I normally see. Photo H.D. 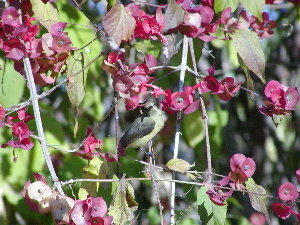 Oschadleus The duller plumaged female Yellowbellied Sunbird. Photo H.D. Oschadleus African Hawk Eagle. This bird seemed to have a favourite perch on a tree on a cliff not far from Frik's house. When first encountered I got quite close to the bird. 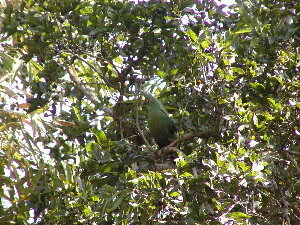 On my next visit the bird circled above me before I could get too close to the tree. Photo H.D. 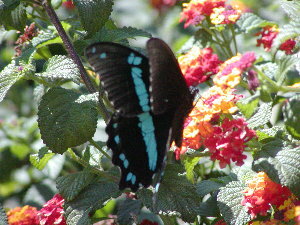 Oschadleus Swallowtail butterfly on exotic Lantana blossoms. I saw many different butterfly species, including Painted Lady. Photo H.D. 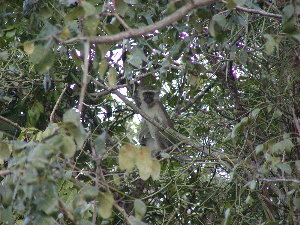 Oschadleus Vervet Monkey. 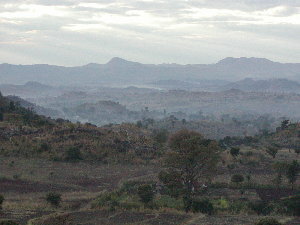 Much of the area around Nkhoma is light woodland, with patches of more dense wood. This patch of woodland was next to a village and was probably the site of a graveyard. When I passed the village, some Chichewa children started following me but when we saw this troop of monkeys the children forgot about me and tried chasing the monkeys away. Photo H.D. 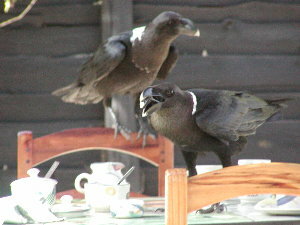 Oschadleus Whitenecked Ravens enjoying a cup of tea! On Saturday we visited the Dedza pottery shop an hour's drive south of Nkhoma. While having lunch here, these ravens showed up at the adjoining table. Photo H.D. Oschadleus En route to the airport (north of Liliongwe) I stopped at the Lilongwe Nature Reserve in the city centre. 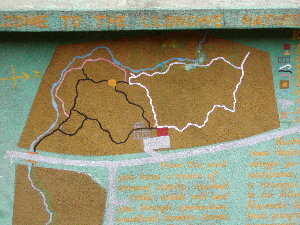 The reserve is a patch of natural woodland next to the Lilongwe River. Photo H.D. 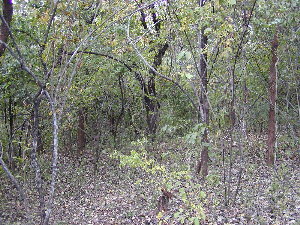 Oschadleus Natural woodland in Lilongwe Nature Reserve. Photo H.D. 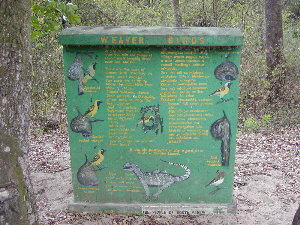 Oschadleus The reserve contains various information signs, like this one of the weaverbirds present in the reserve. Unfortunately the weavers were not breeding, so I only found Spectacled Weaver, but there were numerous old weaver nests along the river from last summer. Photo H.D. Oschadleus Schalow's Lourie, a species not found in southern Africa, but similar to the Knysna Lourie. Photo H.D. 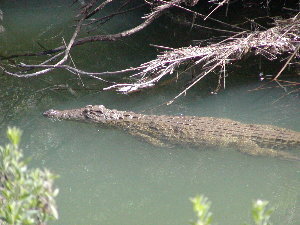 Oschadleus Nile Crocodile swimming past in the Lilongwe River. These crocs are wild and there are no fences between the river and the paths! Fortunately there is a high bank along most of the river in the reserve (and lots of warning signs). All the birds I recorded are reasonably common around Lilongwe, with the exception of the Black Sawwing Swallow (* below) which occurs south in the lower Shire valley. 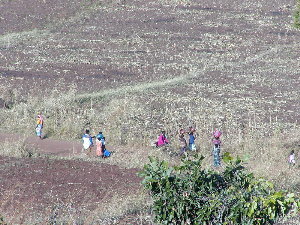 A flock was seen near Nkhoma Peak on 1 July. 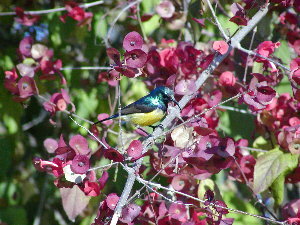 The most frequently seen bird in the garden at Nkhoma was Yellowbellied Sunbird. The most frequently seen bird in the woodland at Nkhoma was African Golden Oriole. The most frequently seen bird in the open areas at Nkhoma was Tawnyflanked Prinia. The most recent checklist for Malawi is: K Newman, N Johnston-Stewart & B Medland. 1992. Birds of Malawi. A supplement to Newman's Birds of Southern Africa.